There are many reasons why some of us have signed up for a gym membership. Among the many logical reasons include wanting to get in shape for the rest of the year, while others see it as an avenue to socialize and build up one’s business network with the side benefit of being healthy, it really is a case of different strokes for different folks. However, there is one particularly undeniable fact when it comes to exercise – it releases the kind of hormones that make us feel good, and is a good way to de-stress. However, sometimes at the office or in other high pressure environments when all you want to do is scream your lungs out and punch someone in the face, the avenue to do so is rarely there. Perhaps the $19.95 Desktop Punching Bag might come to your aid? 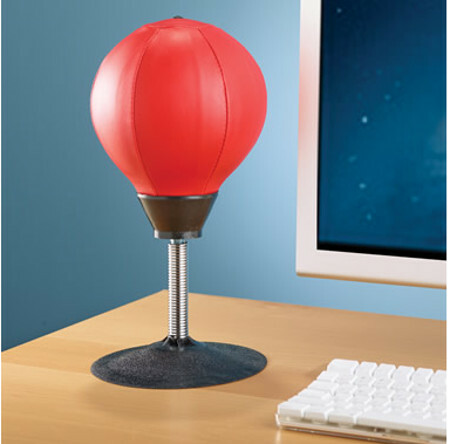 The name of the Desktop Punching Bag says it all – this particular punching bag will be stuck to your work desk using suction cups, so that it offers an impromptu and immediate outlet for stress relief. It is perfect for re-directing pugilistic urges wherever you are – at the office, or even at family holiday gatherings. Of course, when no one else is looking, you can stop using your imagination so much and actually place a photo of that person whom you do not get on too well with, before punching your heart out. The inflatable 7″ diameter synthetic leather ball is capable of withstanding its fair share of knocks, where it rebounds reliably thanks to a heavy-duty spring. Not only that, it would not remember every hit it has received from your fists, making it the ideal tool to vent your frustrations without hurting anyone.